My card today was inspired by the My Mind’s Eye sketch challenge for April. 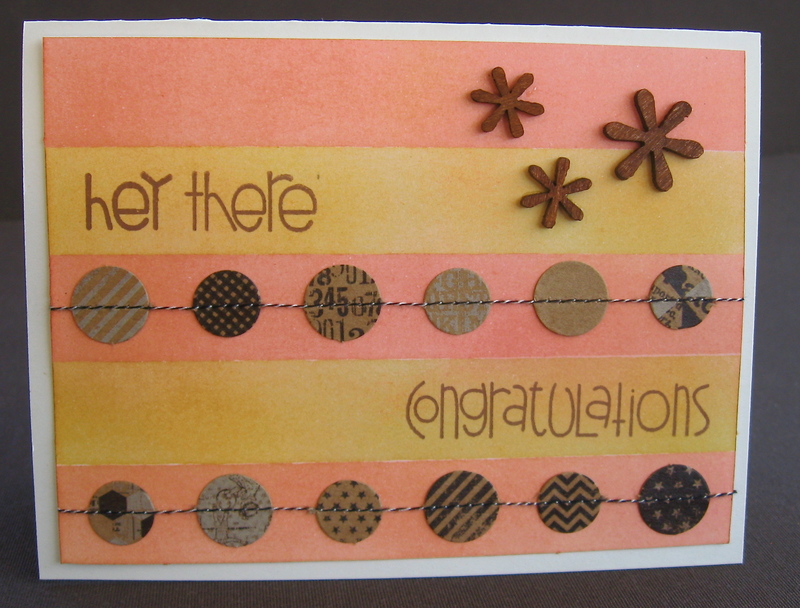 I am also entering this card in the “Anything Goes” challenge at Simon Says Stamp. I flipped the sketch on its side and used a silver-embossed thank you card (10 for $1 at Michaels) as the card base. The patterned paper butterflies were created with my Studio Calico butterfly mask-I just traced around the masks and cut them out. 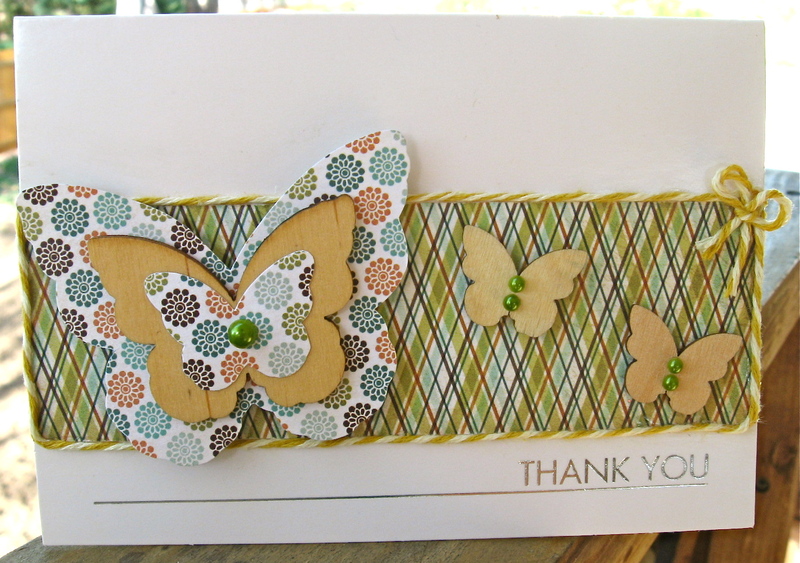 After adhering the wood veneer butterfly in between, I added dimensional adhesive underneath to pop the whole piece up off the card. 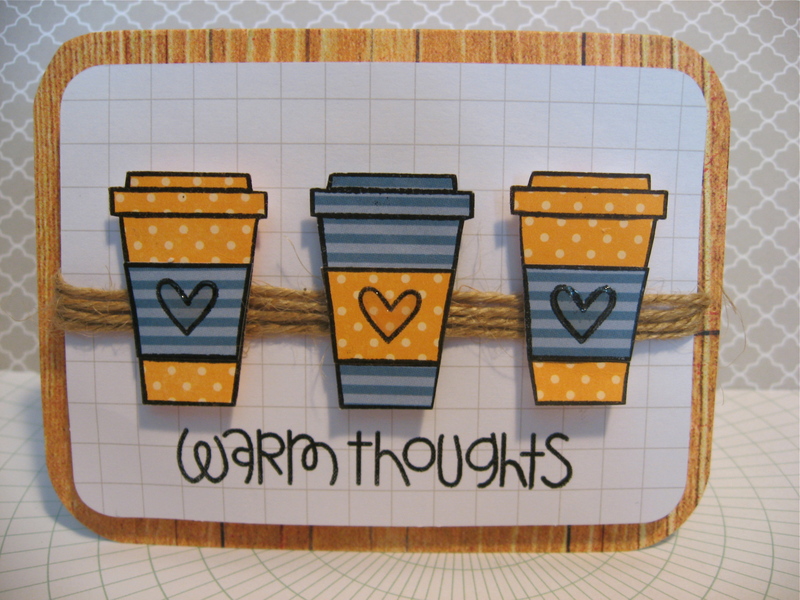 To create this card, I masked off the card with washi tape, and alternated my Distress Ink colors for the background. I also inked my veneer with mist. The Paper Variety challenge this time around was to make a project based off of a Paper Variety tutorial or design team project. I chose this video by Abby. I encourage you to watch the video-she makes a super cute card and this is such a cool technique! Basically, she masked off the outer edges of her project, and created a scene in the middle. I actually used washi tape to mask off my border-worked a double bonus-easy to apply, and the overlapping ends stuck my project to my work surface while I inked the middle. 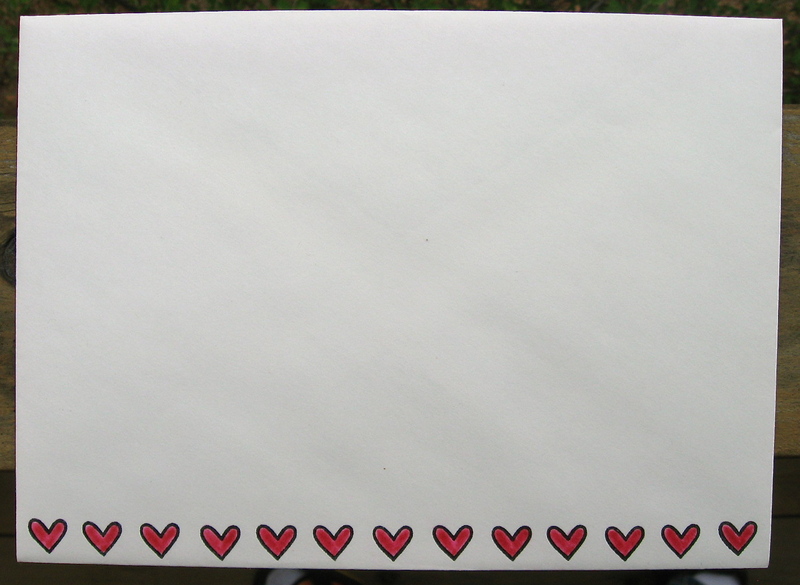 Just make sure to use low-tack washi tape. The first time I tried it, I ripped the card taking the tape off. The background was created with Distress Inks, and all of the stamped images were painted with mists. So, there you have it-my take on the challenge! 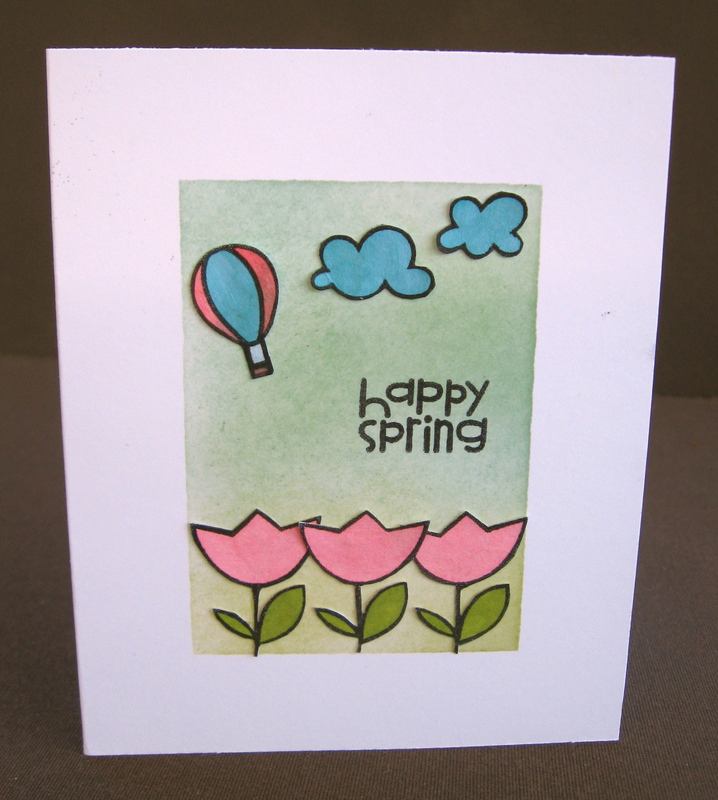 I am also submitting this card to the Create blog challenge this week to make a spring card. For this challenge, I was inspired by the colors (I used a lot of blue and orange), and the distressing (on the letters) led me to use some distressed wood paper and twine. As I am homeschooling-we start officially this fall, but have been doing a lot of Preschool/Kindergarten stuff over the last year-I LOVE that I can find so many fabulous school ideas on Pinterest! So, I was able to find a similar style of chart on Pinterest, and as soon as I did-she became super excited about school again! 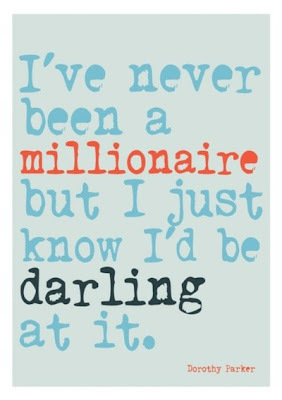 Ah, it’s the little things! I found others as well, so we might use a different one next, or I might even make my own. 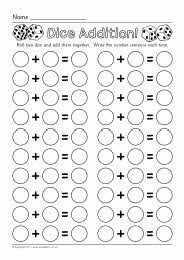 I like that there are twenty-five circles too-and every time she completes a double-sided worksheet, or a school activity, she gets to put a sticker on one of the circles. She LOVES it (can you say goal-orientated? Wonder where she gets THAT from?????)! This is such a great activity because we practice writing numbers, math problems, and it’s a game (you roll dice, and then fill in the circles.) They have pages with just five, all the way up to 24 to a page, so it is perfect for beginners or older kids, and you could totally change the plus to minus, multiplication, division-fun stuff! Anyway, I saw this week that the free shape in the Silhouette store was the United States, and that immediately gave me the idea for this card! I really like how it turned out (it really did look a LOT better in person too!) 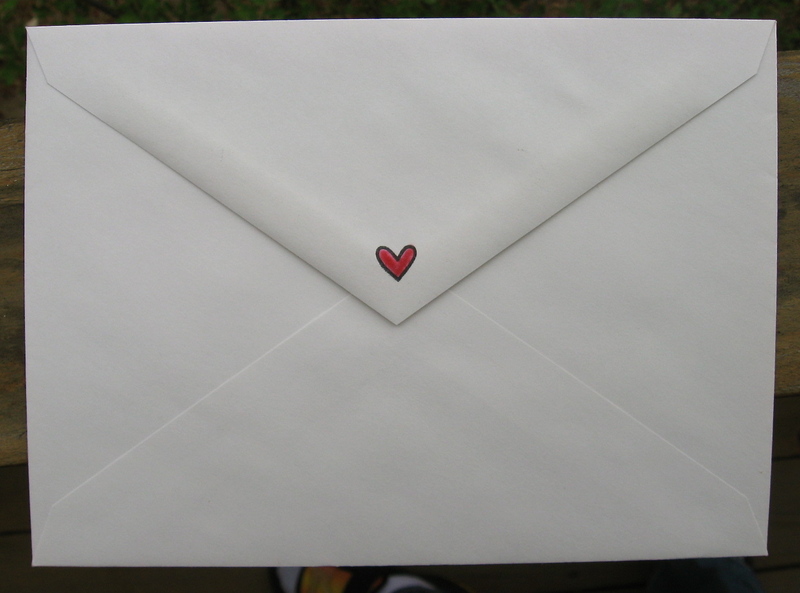 This design really makes the perfect moving away kind of card! Anyway, I am getting back into the swing of things, so look for more posts from me soon! 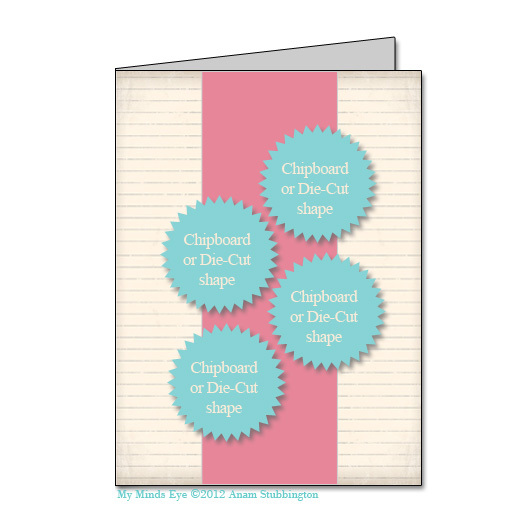 I previously posted here my design team application projects for my local scrapbook store-Simple Pleasures. I wasn’t chosen for the team, but was chosen to be a guest designer, and will have some fun projects I will be creating for the store this summer! Also, I applied for the design team call at fortheluvofart.com-a place I really enjoy hanging out at online. I was chosen as a guest designer there as well! So, I have some fun stuff coming up! 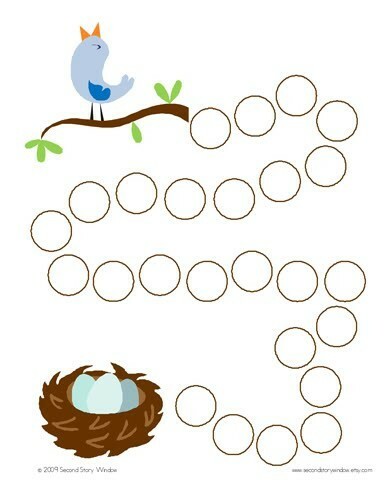 Also, I had my Easter card featured on the Create blog this past Thursday. Well, that’s the scoop from here-look for a card from me this Wednesday!